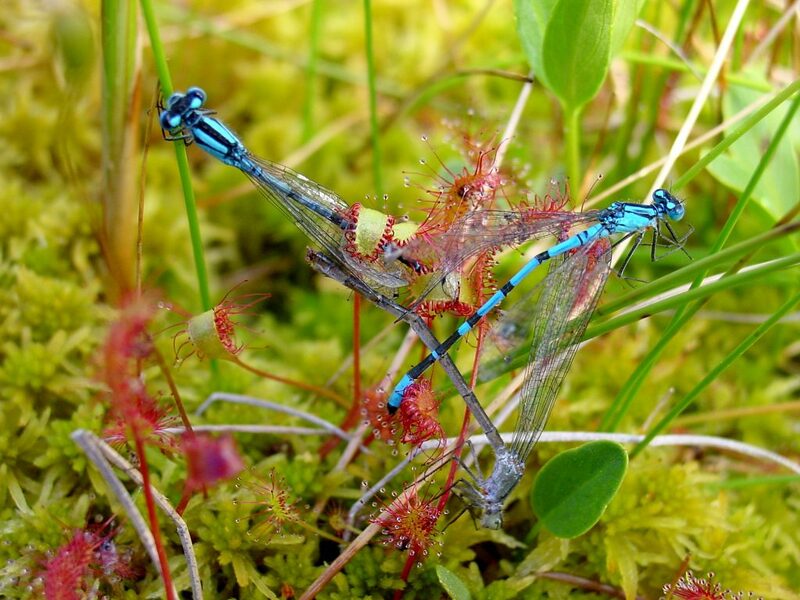 Moyclare Bog was most recently surveyed as part of the Raised Bog Monitoring & Assessment Survey 2013 (Fernandez et al. In prep) and the LIFE team are currently ground-truthing the site in advance of restoration work. According to the most recent survey (Fernandez in 2013) Active Raised Bog (ARB) covers 21.70ha (29.22%) of the high bog area. There are no active flushes at the site and high quality Active Raised Bog consists solely of central ecotope, in which the microtopography consists of Sphagnum hummocks, hollows, lawns and pools. 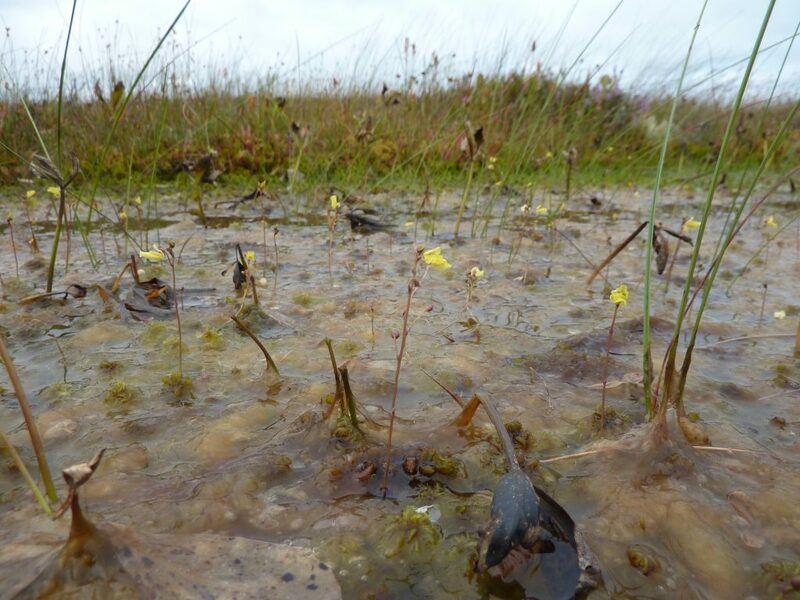 Total Sphagnum cover exceeds 90% in the wettest areas, and pools, which typically have a very high cover of S. cuspidatum, are present throughout. Degraded Raised Bog covers 52.56ha (70.78%) of the high bog area. It is drier than Active Raised Bog and supports a lower density of Sphagnum mosses. It has a less developed micro-topography while permanent pools and Sphagnum lawns are generally absent. This habitat at Moyclare Bog consists mostly of sub-marginal, marginal and face bank ecotopes, while a single small area of inactive flush was also recorded. Depressions on peat substrates of the Rhynchosporion are found in both Active and Degraded Raised Bog, but tend to be best developed and most stable in the wettest areas of Active Raised Bog. At Moyclare, the habitat was most abundant in the central ecotope community complexes 10/15 and 14, and in the sub-central community complex 4/10. It was also present in Degraded Raised Bog community complexes, but tended to be uncommon and mostly restricted to run-off channels or small tear pools. The LIFE project team are currently mapping and surveying the site. Our report on the flora and fauna of Moyclare will follow here soon. In the meantime, previous reports have indicated that Moyclare is very much a living bog. Much of the bog surface corresponds with ARB and is very wet, though not quaking, with a high cover of Sphagnum beneath a sparse cover of Calluna vulgaris and abundant Trichophorum germanicum. Vaccinium oxyccocos is especially abundant on lawns of the moss Sphagnum magellanicum. The ARB at Moyclare Bog comprises both central and sub-central ecotope. 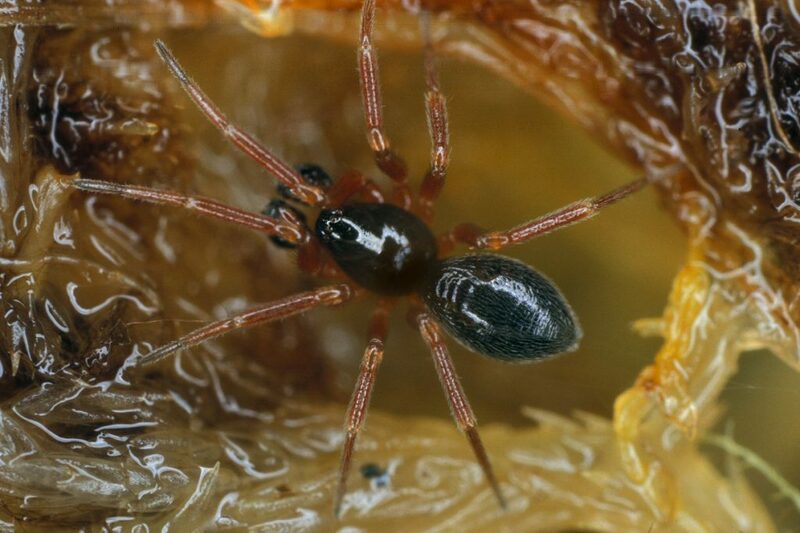 Central ecotope was found at two locations on Moyclare Bog in the 2012 survey (Fernandez et al. 2014), and two community complexes were recorded in these areas. One complex generally represents the wettest conditions on the high bog, where overall pool cover is in the range of 34-50%, and even higher in some of the wettest areas. Pools are typically filled with Sphagnum cuspidatum, while quaking mats of Sphagnum – mostly S. papillosum and S. magellanicum – also form a significant part of the Sphagnum cover. Total Sphagnum cover is in excess of 90%, and the microtopography, in addition to extensive pools, includes high hummocks, low hummocks and hollows. There is a flushed element to the vegetation, indicated by the presence of species such as Aulacomnium palustre and Molinia caerulea. However, the whole of the central ecotope also supports these species and there is no distinctly flushed zone within this larger area. Rhynchospora alba is present in significant abundance (Fernandez et al. 2014). The other central ecotope complex consists of interconnecting pools, low hummocks, high hummocks and lawns. Pools cover up to 25% of the total complex area and many of them have a substantial cover of Sphagnum cuspidatum, with lesser amounts of S. denticulatum also present. Sphagnum papillosum and S. magellanicum form significant lawns, with the former also present in low hummocks, as is S. capillifolium. 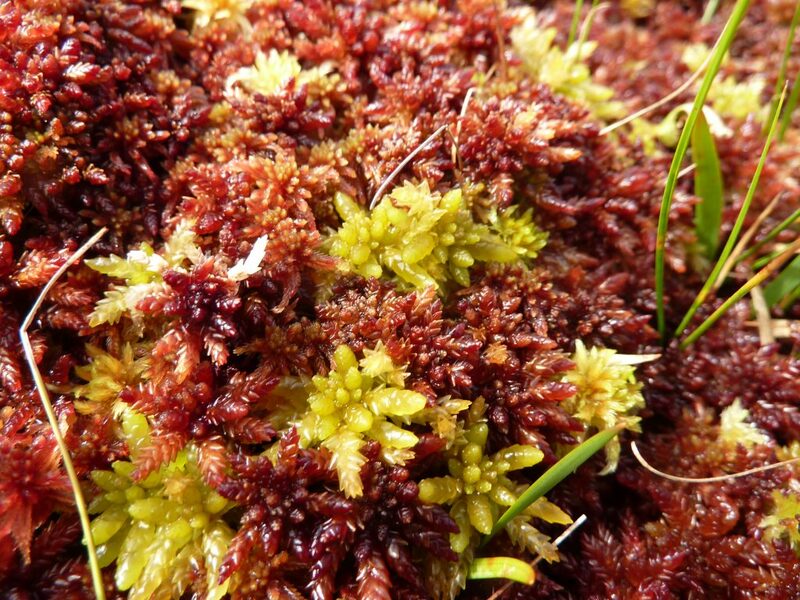 The hummock-forming S. austinii and S. fuscum were also recorded in the complex, while the total Sphagnum cover is in the range of 51-75%, and as high as 76-90% in places. This complex is one in which Rhynchospora alba is present in significant abundance, while other significant elements of the vegetation included Calluna vulgaris and Eriophorum vaginatum. As is the case with the other complex, typical flush species such as Dicranum scoparium and Vaccinium oxycoccos are also present, although not so abundantly, either individually or collectively, as to justify the mapping of a distinct active flush area at the site (Fernandez et al. 2014). Sub-central ecotope was found at three locations on Moyclare Bog and three community 12 complexes were recorded in the 2012 survey (Fernandez et al. 2014a, b). There is a good microtopography with high hummocks, low hummocks, hollows and pools. The pools are generally filled with Sphagnum cuspidatum and cover approximately 10% of the total area. The total Sphagnum cover is in the range 34-50%, and up to 51-75% in places. Sphagnum capillifolium and S. papillosum dominate the low Sphagnum hummocks, while small active hummocks of S. fuscum were also recorded. Eriophorum vaginatum forms a significant element of the vegetation, with E. angustifolium also present, though less abundant. However, in one of the sub-central areas, the ground is particularly wet in places and E. angustifolium becomes as frequent as E. vaginatum. In this area Rhynchospora alba is abundant. 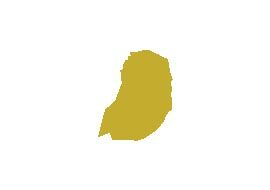 The microtopography of this sub-central area is very good with high hummocks, low hummocks, hollows, lawns and pools. Pools, which cover up to 10% of the total complex area, have a generally good cover of Sphagnum cuspidatum, while this species is also found in hollows throughout the complex. S. papillosum and S. capillifolium are common in low hummocks and at pool edges. Total Sphagnum cover is in the range of 34-50%, and is up to 51-75% in the wettest areas. Other common species include Calluna vulgaris and Eriophorum vaginatum. The third sub-central complex recorded at the site is broadly similar to the other sub-central complexes, but differs in being partly characterised by the occurrence of Carex panicea with an overall cover value of 11-25%. 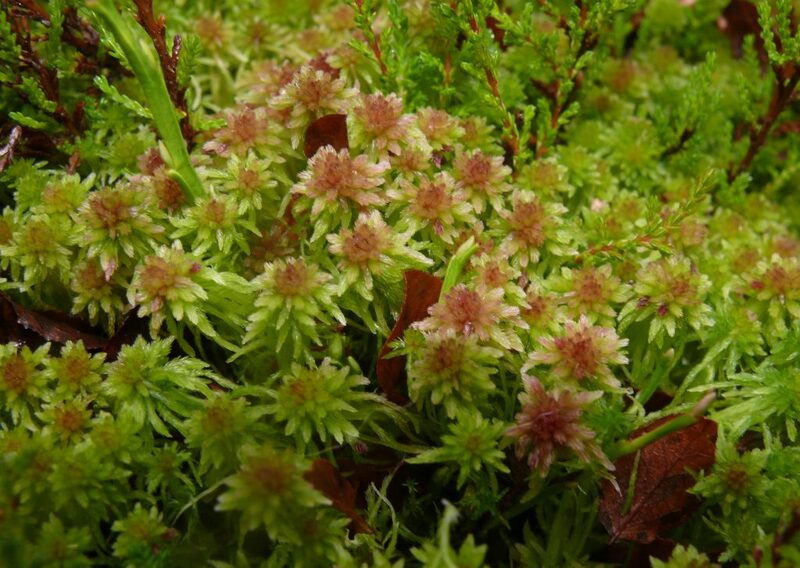 In some parts of the sub-central ecotope, there is a greater amount of Narthecium ossifragum in the flats, signifying a drier, slightly degraded example of the complex, although the overall Sphagnum cover is still in the range of 34-50%. In common with much of the ARB on the bog, flush species such as Aulacomnium palustre, Vaccinium oxycoccos, Andromeda polifolia and Polytrichum strictum were recorded in this complex, but not so abundantly as to warrant the mapping of distinct flushed areas. Rhynchospora fusca was recorded in a single pool in this complex. The remainder of the high bog area consists of sub-marginal, marginal and face bank ecotopes, some of which corresponds with DRB. The vegetation is dominated by mixtures of Calluna vulgaris, Eriophorum vaginatum, Trichophorum germanicum, Narthecium ossifragum and Carex panicea. Sphagnum cover is poor, typically <20%, and there are other indicators of degradation such as the presence of Molinia caerulea and Myrica gale. The bog becomes drier towards the northern boundary, especially north of an old track which traverses the dome. In many of the driest areas of the high bog there is invasion of Pinus sylvestris onto the bog surface. There are two small inactive flush areas recorded on the high bog. Rhynchosporion vegetation is best developed in the wettest central area of the high bog where numerous small pools occur. Typical plant species within these pool areas include the bog mosses Sphagnum cuspidatum and S. denticulatum, Drosera anglica, Eriophorum angustifolium and Menyanthes trifoliata. There are also a number of small lawn areas on the wet bog surfaces dominated by Rhynchospora alba and, locally, the scarce Rhynchospora fusca. In areas of sub-marginal ecotope the Rhynchosporion vegetation is mostly restricted to run-off channels or small tear pools. As well as the scarce Rhynchospora fusca, other notable plants known from the site include Huperzia selago and the liverwort Pleurozia purpurea. For further details of the flora of Moyclare Bog see Kelly et al. (1995) and Fernandez et al. (2014a, b). The common frog (Rana temporaria) is known to occur on the bog. The only mammal recorded from the high bog is Irish hare (Lepus timidus hibernicus). Badger (Meles meles) and Fox (Vulpes vulpes) have been recorded in the SAC according to 2004 data in the National Parks and Wildlife Service archive. 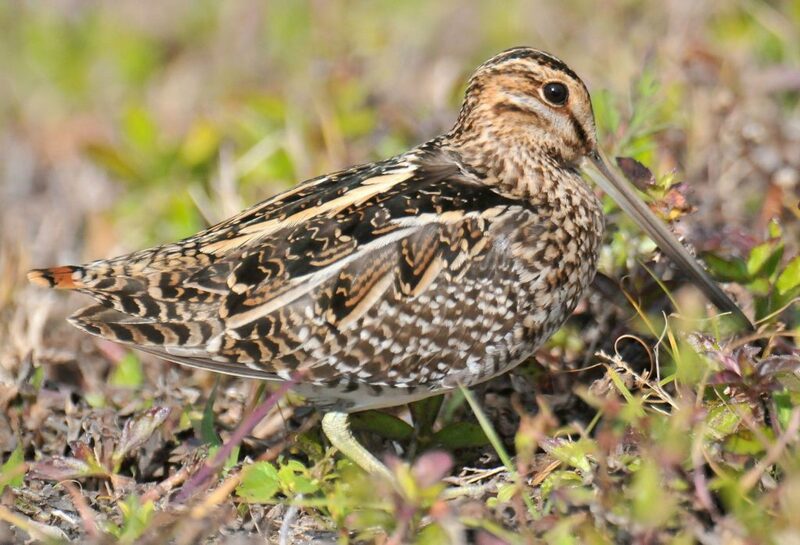 Snipe (Gallinago gallinago), curlew (Numenius arquata), meadow pipit (Anthus pratensis), skylark (Alauda arvensis), and lapwing (Vanellus vanellus) are reported to have bred within the SAC (NPWS 2004). The curlew is under threat, and a recent taskforce has been established by the Department of Arts, Heritage, Regional, Rural and Gaeltacht Affairs as there are as few as 122 breeding pairs in the entire country. Pheasant (Phasianus colchicus) and woodcock (Scolopax rusticola) occur at the site margins while other birds that frequent the site include sparrowhawk (Accipiter nisus), kestrel (Falco tinnunculus), and merlin (Falco columbarius) (NPWS 2004).